It's been 4 years of ups and downs, sharing and separation, hope and disappointments, laughter and heartache. I think, at long last, our spiritual son and prodigal is finally coming to his end of running. I remember back to when I first met Aroldo, our hearts connected instantly. He was staying at a facility to deal with his drug and alcohol problem at the age of 20. In that first year, he left the facility at least 3 times and since that time he has been in 2 other facilities outside of our area. We have visited him on Christmas Day twice; once in rehab and most recently while he was in jail. He has lived in our home a number of times, only to walk away unexpectedly. One year it was on Thanksgiving Day. We had a wonderful day of celebration. While Aroldo was sitting on our front step alone watching his friends play soccer, he got up and walked away - with one of his friend's iPod which he ended up selling for drugs. Fast forward a year, to another time when he was living in our home. I was in my office and he came in to say he was going to visit his ailing father for the afternoon, which he had been doing for over a week. He said good by, stood and looked at me. Then he walked across the room, came to where I was sitting and slipped his arms around my neck, gave me a strong hug, a kiss and left. He never returned that night. Sobriety, peace and happiness is not something that comes easy to Aroldo. He has had to fight for every minute of his sobriety. 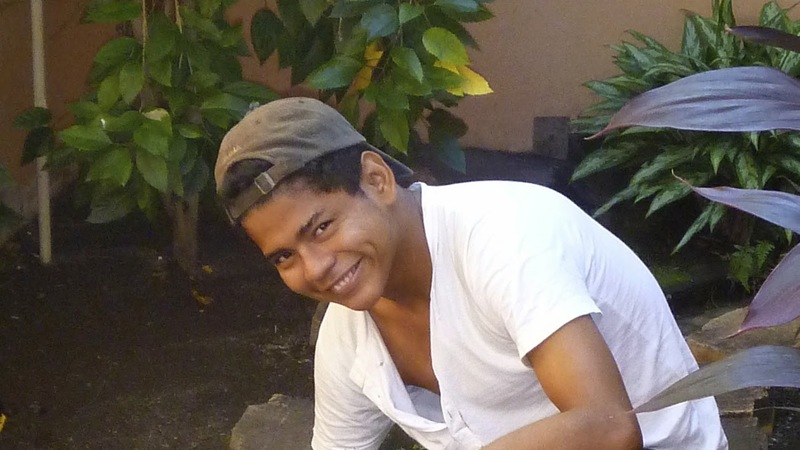 Of all the boys that we have cared for and educated since our arrival in Nicaragua, he is the boy that has been the most hungry to know God and His Word. He has experienced the presence of the Holy Spirit in his life. Preston has had the privilege of baptizing Aroldo. And yet, the demons still haunt and capture him; leading him to live a life that is destroying him physically, mentally, emotionally and spiritually. Recently, while Preston was in the States, Aroldo and I spent a day together. He came over and fixed me breakfast; his passion is cooking! We talked about his life, past and future. He said that he carries too much shame and he felt it was too late for him to have any hope for a future. He also said that he was afraid that God would not forgive him. I spoke to him about our friend Benjamin and his program of rehabilitation for addicts. He promised that he would think about the possibility of spending time at Benjamin's farm. A month later, I received an email from Aroldo saying he had spent 4 days in the hospital. No mention of what the problem was, but in my heart I knew - he'd been beat up. Why else would he not tell me what the problem was. We exchanged notes and he promised to come see me soon. It just gave me more of a confirming sense that he did not want me to see him in his condition. A week ago, he came to our house for breakfast after a doctor visit. When I opened our front door to him, it was apparent that he had indeed been beat up. After eating, we talked about what had happened and asked him if he was finally ready to go to Benjamin. He asked "when", we said "now". After a quick call to Benjamin to ask him to pick us up at the town square where he lives, we were out of the house in 10 minutes heading to the bus depot. We spent the entire afternoon on Benjamin's farm tucked away amongst the sugar cane. He spoke to Aroldo about his addiction, his sins and God's plan for his redemption. There was a visiting pastor friend at the farm which was by God's divine appointment. We all spent time praying over Aroldo; the pastor had a Seer gift and spoke against the secret sins. Aroldo renewed his commitment to follow God and we saw a miracle. One of the injuries that Aroldo sustained was to his eyes; his left eye had been hit repeatedly with a rock. God in His Mercy restored the muscle coordination and the redness of the eyeball was fading. Aroldo had 2 doctor appointments that were scheduled during the upcoming week and we all agreed that he needed to continue with his doctor visits because of internal injuries. We left the farm with a promise that we would return in a week with Aroldo to begin his time of restoration. Yesterday, we took Aroldo out to the farm to begin a 20 day stay. Benjamin has a son named Ishmael who is involved in the work of rehabilitation and restoration; he joined in the conversations. It was important to talk about the nightmares that Aroldo had the night before; the devil is not going to let go easily. We left Aroldo knowing that he was comfortable about where he would be staying for the next 3 weeks. He was hopeful about what he would learn and said that he knew it was important for him to get a firm foundation in the Word. He said he wanted to improve his relationship with God. He's in very good hands with Benjamin and Ishmael; God now has Aroldo's undivided attention to show Himself.